We sat down with Cristina Eghenter from WWF-Indonesia and the Heart of Borneo program, to talk about how her focus on governance is a unique, but growing, approach to conservation. What is your role at WWF? My official title at is Deputy Director for Governance and Social Development, which encompasses a synergy of a few distinct, but overlapping and related, roles. Governance has been a big focus in WWF-Indonesia through our work in protected areas, payment for ecosystem services, and carbon markets (i.e. benefit-sharing). 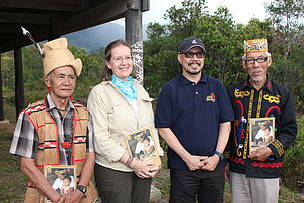 I also work as the leader for civil society engagement for WWF’s Heart of Borneo ecoregional program, in which WWF works to support three countries, Brunei, Indonesia, and Malaysia, to protect and sustainably manage the forests on the island of Borneo in partnership with the private sector and civil society. And I’m also active on the Core Team and Steering Group of the Social Development for Conservation (SD4C) as the Asia-Pacific regional network coordinator. SD4C, is a community of practitioners and experts on social development who share ideas, innovations, and sharpen our skills. These kinds of platforms and partnerships are so energizing and really help provide a cross-cutting perspective that increases our capacities and deepens our understanding of issues like equitable governance and indigenous peoples’ rights which are so crucial to conservation work in many parts of the world. Among several initiatives, I would single out indigenous and community conservation areas and territories – or ICCAs – as a big issue in WWF-Indonesia, and have been since I first organized a formal workshop on them in 2008. It’s a focus that really shows how different approaches can be combined (rights, livelihoods, and protection of forests) and are situated in different regions. Much of indigenous peoples’ rights work is already embedded the national policy in places like Latin America, but it really needs a strong push from civil society in Asia. In Indonesia, most lands that have high levels of biodiversity and high conservation value are indigenous lands and territories, so it’s very important to ask how we can partner with, advocate for, and support indigenous peoples and local communities to be part of the conservation and sustainable development movements. Of course, not all communities are the same or have the same goals, but first we need to acknowledge them as potential partners and ally with them in their agendas to maintain control over their territories and conserve the resources that constitute the basis of their livelihoods. This kind of work is crucial – it shows that a commitment to human rights, especially indigenous rights, has a really beneficial impact on conservation and sustainability. This is really where my work connects with REDD+, even though I don’t work explicitly within the mechanism. If we think about rewarding national parks for doing what they are supposed to do, or companies for implementing best practices, what about rewarding indigenous peoples and local communities who have been preserving and managing forests for generations? That would bring real and concrete benefits to local people on the ground. The dedicated grant mechanism in Peru is a good example of innovating to make sure we create the right rewards for all the stewards of the forests. I am always reminded that when you learn from indigenous peoples, especially elders, they make you think with seemingly simple statements. Back in the early days when my work was mainly directly with communities, making sure they could participate in the management of a national park in their territories, community members would say, “Well, we have done this [protecting the forest] for hundreds of years, so what will be different for us [with a national park]? What are the additional benefits?” REDD+ faces a similar challenge. How did you get involved in this kind of conservation work? My background is not in conservation but in anthropology, especially focusing on women and development, so I bring a social rather than purely scientific perspective to my work. Much of conservation is about how people interact, and how they value and use the resources around them, so it is important to consider the social and cultural spheres when working in conservation. I started working with WWF on the management of the Kayan Mentarang National Park, which had been declared without consulting indigenous peoples even though their territories overlap with the 1.3 million hectares of the park. We conducted ethnohistorical research in ten customary indigenous territories, including supporting community mapping of 1.8 million hectares of forests, and thus learned a great deal about how indigenous peoples managed the forest and used zoning – setting aside some areas for agriculture, some areas as protected or for limited use, others as sacred. WWF worked to combine the different views of forest protection so local people would be allowed to have access and continue their practices within the national park. It was a long advocacy process of something like 10-12 years, because the national laws were strict and adhered to the old paradigm of local people as a barrier to conservation. WWF-Indonesia worked closely with indigenous partners to advocate for change, successfully arguing that the benefits of enabling collaborative or co-shared management would outweigh any legislative or transactional costs, and be more efficient. It was a victory, because it was the first national park in Indonesia to be granted collaborative management status. But while the example of this park has inspired other national parks to be more vocal about adapting or adopting local practices and engaging indigenous peoples, the legislation has not yet fully changed. That’s why social development is the center of my conservation view, and why I work to integrate it into our broader conservation agenda. How is something like governance, which can be an abstract academic term, related to conservation? How can they support each other? It’s fundamental! I like to think, coming from the social development perspective, that in conservation the bulk of the matter is really how and who makes decisions about use of natural resources – and that’s governance. Management is making the ‘what’ decision, or planning, but the governance sphere is the ‘who’ and the ‘how’; and good governance is enabling the right process that leads to the right decisions about resources use. Is there one area you think needs more attention under current conservation strategies? If so, what is it and how can we better incorporate it? I think that the conservation community has generally struggled to show the immediate economic value of conservation, which is still often seen as being against development. There has been a lot of progress made towards advocating that preservation, sustainable use, and conservation are part of sustainable development, but that we still have a ways to go. Even the Sustainable Development Goals still reflect this basic mindset. The environment is more explicitly locked into a few goals, and then you have separate economic ones that appear rather detached from environmental considerations. We still have to push that we live on a finite planet, and that we must act quickly to preserve the integrity of our environment and our climate. The paradigm that economic growth will solve all problems is still fundamentally embedded in development plans of developing and emerging economies, it’s vital that we provide more examples of on the ground alternative conservation experiences and policies that really bring impactful development gains. WWF is working on this, but no matter how big we are as an organization, we still need to work with others, removing and blurring the boundaries to create movements for conservation and sustainable development, and finding new ways of working together.